A ring symbolizing the favor of the Goddess Fina, whose "fateful beauty" is mentioned in legend. True to the fickle nature of Fina's favor, her ring increases max HP, stamina, and maximum equip load. Increases max HP by 3%, Stamina by 8% and max Equip Load by 5%. 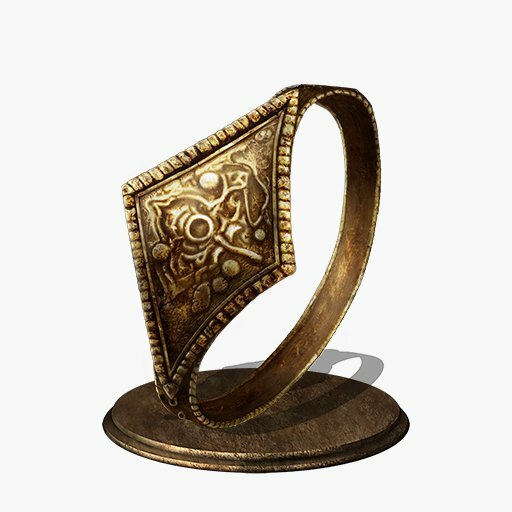 Ring of Favor Increases max HP by 3%, Stamina by 8% and max Equip Load by 5%. Ring of Favor +1 Increases max HP by 4%, Stamina by 9% and max Equip Load by 6%. Ring of Favor +2 Increases max HP by 5%, Stamina by 10% and max Equip Load by 7%. Ring of Favor +3 Increases max HP by 6%, Stamina by 12% and max Equip Load by 8%. Received for defeating the two Sulyvahn's Beasts in Irithyll of the Boreal Valley, in the water reserve. Ring of Favor New Game Received for defeating the two Sulyvahn's Beasts in Irithyll of the Boreal Valley, in the water reserve. Ring of Favor +1 New Game+ Found in Irithyll of the Boreal Valley, above the Pontiff Sulyvahn bonfire. Ring of Favor +2 New Game++ Found outside of the Cathedral of the Deep, on a corpse near the entrance to the rafters. Ring of Favor +3 New Game Found in the Dreg Heap, up a large root near several Poisonhorn Bug, to the right in the swamp just after the Earthen Peak Ruins bonfire.